This web page was from the begining foremost dedicated to my school project, which took place between the fall of 2010 and the spring of 2011. Basically the project was to build an Electric Balalajka, and with this I succeeded. Hopefully the page will continue to develop and hold more information about balalajkas, other things that I have planed on adding are chords, tabs and musical sheets. This page contains much information of my work with building an electric balalajka. If you have the same plan in your mind, this webpage should provide you with some help, if you have got any additional questions or suggestions on how to improve balalajka.com, feel free to contact me! The Balalajka is a Russian instrument that was developed sometime in the 18th century. In different languages it can be spelled differently, some of them are "balalaika", "balalajka", "balalayka" and "Балалайка". This is one of the reasons to why it might be hard to find information about it on the Internet. 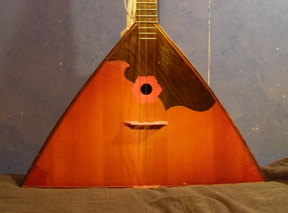 It is believed that the balalaika evolved from the domra, you could easily call the balalaika a simplified version of the (three stringed) domra. The domra got a circular shape and is therefore much more expensive to produce, the balalaika on the other hand is due to its shape much cheaper and easier to produce. Therefore it got available to the "common" people in a much larger scale. There are several different types of balalajkas, all of them are tuned differently. The different types are as follows, largest to smallest: Contrabass, Bass, Alto, Secunda, Prima and Piccolo. Balalaikas exist with both two-, three-, four- or six-strings. The characteristic thing for all the balalajkas is that they got a body in a triangular shape. The most usual is the prima balalajka, which functions well both as a solo instrument and in an orchestra. Normally you can have it in two different models with three- or with six-strings, (though there also exist two- and four-stringed versions, but they are very rare.) There is no real difference in how the two models are tuned, the extra strings are added so that the result is three double strings. The difference in sound is very noticable and is in a sense similar to that of a 6-stringed guitar versus a 12-stringed guitar. If you want to know the name of the different parts of the balalajka, take a look at basic under the categories. To keep your balalajka tuned correctly, I would recommend you to use a pitch pipe, today you can use your computer or mobile phone to tune it easily. Personally I use "Cleartune" which is an iPad/iPhone app. It is a pretty good solution to have it on your phone as it makes it easier to find and in addition you already carry your phone with you almost everywhere. Really old balalajkas use gut strings, later on metal strings were used, nowadays the most usual combination are two nylon E-strings and one metal A-string. (This means that the E-strings are much wider than the A-string.) If you need new strings to your balalajka then here is a good tip: Buy one metal (1st) A-string for a guitar, (0.011" in width) and two nylon strings for a guitar, the 3rd G-string. (0.040" in width). Another alternative to consider might be to buy carbon-fiber strings, but I have yet to test this myself. If you want an explanation on how the balalajka works and how you play on it, I would tell you that you play the melody of the songs on the A-string and then accompany yourself on the two E-strings. I have never heard an experienced balalajka player express him- or herself in this manner, so I can't guarante that they would agree with my picture of it. This also differ a bit depending on what melodies you play/your playing technique, but I have found this to be the best way to describe the playing style of the balalajka. Furthermore this could be seen as a part of an explanation on why the balalajka sound is so unique. For information about the strumming part, I would direct you to either YouTube or some other website specializing in balalajkas, as iBalalaika.com. You could also always buy a balalajka book online or try to find one at your library. I will end this subject with a Swedish saying that is a bit relevant to the three strings on the balalajka. "Alla goda ting äro tre" translated to English it goes something like this "All good things go by three". Interested in buying a balalajka? If so I recommend you to look in your local secondhand store. If you can't find one there, then you probably have to buy one online. Take a look on eBay.com/eBay.de or eBay.co.uk. (Here in Sweden, I would also recommend you to take a look at Tradera.com or Blocket.se). You should be able to get your hands on one for a pretty good price, of course the "real" balalajkas will be a bit more pricey. Tips if you are looking to buy a balalajka. There are some things that you should be looking for when buying a balalajka. If this is your first balalajka then buy the cheapest one that you can find and get a better one when you know some more about it and are sure that you want to continue playing. This is at least what I recommend. Take a look at the fretboard, how many frets are there? A real concert balalajka should have 24 frets in total, which gives you two octaves, though this seldom matters when you are playing on it. Does the balalajka got a pickguard? Souvenir models are completely missing these and if you play much on them there is a risk that you damage the wood while strumming. The souvenir balalajkas are missing these things, but they work excellent to play on. They can be bought pretty cheap as new. Even though it might sound cool with 6 strings, according to Bibs Ekkels book "The Complete Balalaika Book", this is often a sign of bad quality and it will prevent you from using many of the traditional playing styles. Other than that there is the usual stuff, look at the condition of the balalajka and if the wood seems okay and so on. I could also give you a warning that there exist some balalajkas that are made of plastic, which are painted with wood color. If you are a beginner at the balalajka, you probably want to find a good way to learn playing. First of there is the traditional and probably the best way, get a teacher, sadly this may be hard for such a unusual instrument. The other methods are that you get a video service as iBalalaika.com or that you find some good literature. If you as me do not understand a word Russian this can prove to be a problem, the best book that I have found so far is "Mel Bay's Complete Balalaika Book" by Bibs Ekkel.